As you might have read previously, I wrote a book and it’s coming out soon through the fine folks at Fangamer.net. 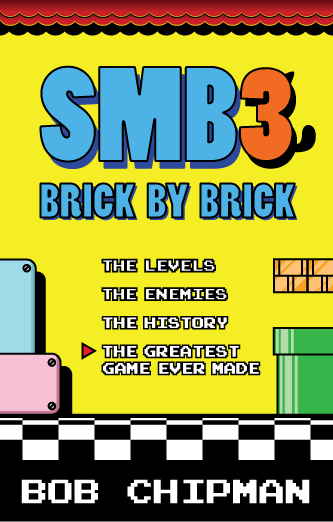 I still unfortunately don’t have a set date date of publication to announce, but I can now officially reveal that we’ll be publishing it under the title “SUPER MARIO BROS. 3: BRICK-BY-BRICK”, and here on your right you can see the cover-art (UPDATE: Now without unnecessary hyphens) that the fine folks at Fangamer put together for it. The basic premise is a “novelized let’s-play.” I’ve re-played SMB3 (my favorite game and my unscientifically-chosen candidate Greatest Game Ever Made) and chronicled not only every step of the journey (along with corresponding noteworthy events of my real life during the months-long experience) but analyzed each and every graphical, sound and narrative element encountered along the journey for their aesthetic, historical and cultural details. Also included: A history of the “Super Mario Bros.” franchise and a separate account of my own personal history as a fan, student and critic of this series in particular and video games as a whole. More details to follow, and YES we’re planning an E-Book. Stay tuned.